When the robopocalypse comes, will you be ready? Or will you at least have some snacks on hand so you can ride out the chaos in an underground bunker somewhere? A snack brand called Halfpops wants to help—partly by stoking fears that highly advanced artificial intelligence will rise up and kill us one day (soon) and partly by offering sustenance to the robofighting code ninjas among us. These two groups need each other to survive, says Halfpops. That’s the premise of the brand’s new digital ad campaign, which teases the concept of Armageddon. It’s all in fun, though, so there’s really no need to worry about death by cyborg (at least not yet). The tongue-in-cheek video, launching Tuesday on YouTube, Facebook and other social media platforms, puts out the call to “binary badasses” across the country to prove their coding skills in exchange for free Halfpops in a handful of flavors. The three-minute video, shot near Lookout Mountain in Tennessee by indie ad agency Humanaut, lays out a doomsday scenario of machine conquering man, complete with images of some creepy walking, talking, lifelike robots. Even though futurists, scientists and tech mavens like Elon Musk and Stephen Hawking have raised this serious issue, it’s clear from the start that the Halfpops video is less conspiracy theory and more satire, even though the outdoorsy hero destroys a kid’s drone in a misplaced fit of paranoia. “When you’re an emerging brand, you really want to get into the conversation, and this was our way to do it,” said David Littlejohn, Humanaut’s chief creative officer. 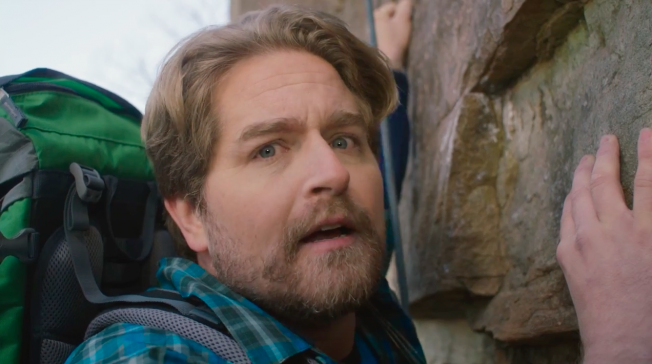 The rock-climbing star of the short film makes a plea directly to code-writing wizards, kicking off a website dedicated to the Halfpocalypse Challenge, halfpops.com/halfpocalypse,and the product giveaway. “Just prove you can code, and we’ll send you this first giant box of Halfpops rations, with 90 frickin’ snacks,” the site says before putting coders through their paces. Hint: Captcha is involved. Once participants finish the quiz, they’ll need to sign an agreement to protect Halfpops’ peeps in the event of catastrophe. “We’re only saving our own skins by making friends with the people who speak robot language,” Littlejohn said. The rest of the world, it seems, is on its own. The company is also promoting the campaign with what it says is the first-ever binary hashtag on Twitter—#0110100001100001011011000110011001110000011011110111000001110011 (which translates to “Halfpops,” apparently). This is the first national advertising push for Halfpops, which competes with everything from traditional popcorn and chips to healthy snacks like nuts and granola. The product, for which the company has a patent, had been sold mostly in the Pacific Northwest since its launch about five years ago. Within the last six months, its distribution has expanded. It’s now available in national retailers like Whole Foods, 7-Eleven and Stop & Shop.